This project attempts to take the first steps toward an exploratory data environment for e-mail corpora, using the Enron e-mail corpus as a motivating data set. 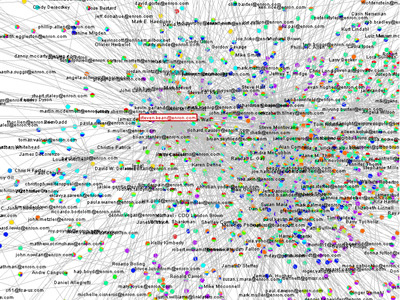 The interface--currently named "enronic"--unifies information visualization techniques with various algorithms for processing the e-mail corpus, including social network inference, message categorization, and community analysis. Though still a preliminary design, enronic shows promise as a platform for more tightly coupling manual and automated data analysis. The graph on the left shows the resulting social network visualization. 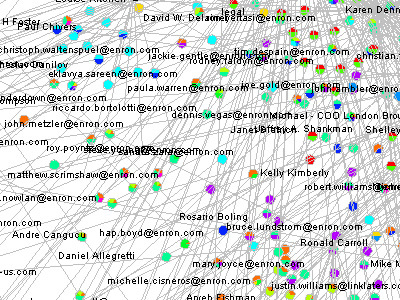 People are drawn as nodes with labels containing either their name or their e-mail address, depending on what was present in the database. Edges represent the histories of ALL e-mail traffic between two people. Pie graphs are placed in the center of each edge, conveying an overall picture of how the e-mail traffic represented by that edge has been categorized.